With Simple AI Like This, Why Does SimCity Need Cloud Computing? 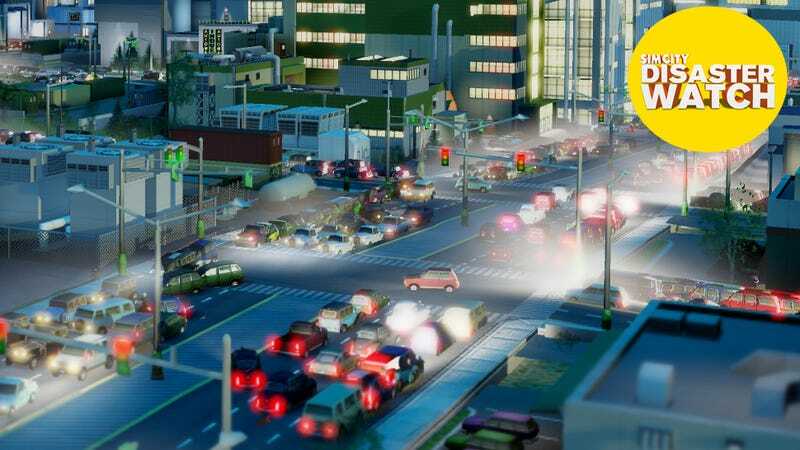 With more and more players able to connect to and consistently play SimCity now, they're seeing what GlassBox, the game's simulation engine, has to offer. GlassBox has been pitched as an enormously sophisticated engine that supposedly requires the game's servers to supply some computing power, necessitating the game's notorious always-online connection. But a lot of forum threads, comments and YouTube videos show behavior unworthy of such a claim. That's an issue because many remain deeply suspicious that the cloud computing isn't really all that necessary, and the claim of it is a cover for implementing an always-online connection as an antipiracy measure. Yesterday, Stephen Totilo showed he was able to play the game, in what seemed like a complete state, for 20 minutes with no Internet connection. Rock, Paper, Shotgun reported that an anonymous developer on the SimCity team said the servers were handling typical cloud tasks, such as storing game saves and routing messages between players. "But for the game itself, no, they're not doing anything," he told RPS. That video shows an evening commute; it was mentioned in this thread over on the game's official forum and has since gotten a ton of traction on NeoGAF and SimCity's subreddit. Sims returning home simply go to the first available house. The singleminded traffic pattern creates issues that break the simulation elsewhere in the city. Over in EA's crowdsourced help forums, a player says"the agent system that is used for utilities (power, water, sewage) seems to be identical to the system that handles traffic," and it seems to explain why services become broken in the city. It explains why, for example, workers on the way to a job don't go to a specific building, they simply go to the first open job and fill it. It explains why casinos go bust unless they're placed right at the entrance of a city, he said, and are harmed by streetcar stops, because tourists are simply shoppers from another town. Public transit next to a casino mean they board a bus and go to the nearest shopping district. "In the evening, when work and school lets out, they all leave and proceed to the absolute closest 'open' house," he notes. "They don't 'own' their houses. The 'people' you see are actually just mindless agents (much like the utilities agents, as I said earlier) making the whole idea of "being able to follow a 'Sim' through their entire day" utterly POINTLESS!!" Here's another video, uploaded on Friday, showing how the game handles pathing when it's given a massive congestion problem and a higher capacity, if longer, alternative route. It doesn't use it. Traffic takes the shortest distance between two points. And still another video in timelapse (but still 10 minutes long) shows a city growing to 200,000 population with entirely residential zones—no commercial or industrial zones, no traffic, and basic services. What's so sophisticated about that? Maxis created the impression that offline computing was necessary to handle this type of performance back in December, when the studio was trying to get in front of the suspicion of (and hostility to) the always-online requirement. The studio's general manager, Lucy Bradshaw said GlassBox "can track data for up to 100,000 individual Sims inside each city. "There is a massive amount of computing that goes into all of this, and GlassBox works by attributing portions of the computing to EA servers (the cloud) and some on the player's local computer," she said. She more or less repeated this statement to Totilo over the weekend, when he inquired about the feasibility of giving SimCity an offline mode. I've asked a Maxis representative for a response to these gamers' complaints and for an explanation of a specific in-game action or experience that depends upon cloud computing, or if the poor AI shown in the video is something that is being addressed by a patch. Any response we receive will be updated here.